I hosted a small but quite fun dinner party last night and for hors d'oeuvres I set up a blini bar - essentially top-your-own blini. Blinis are little savory pancakes that make the perfect (delicious!) delivery method for smoked salon, caviar, asparagus tips or whatever you want. 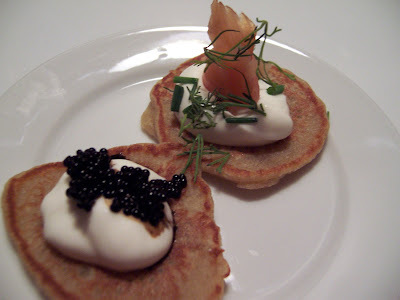 The blini recipe is from the new edition of Joy of Cooking and is fairly straightforward, although there are many other great versions. Heat milk in a small saucepan, add butter and heat just until butter melts. Remove from heat and add yeast, let stand 5 minutes, then stir to ensure yeast is dissolved. Meanwhile, mix all dry ingredients in a large bowl. Pour milk mixture over dry mixture and stir to incorporate. Cover tightly with plastic wrap and let stand for 1 hour in a warm place. After 1 hour, batter should be almost doubled in size (mine wasn't, but they turned out fine). Stir down batter and add 2 eggs. Let stand 5 minutes, then make blinis using a tablespoon to ensure they are the same size. Cook in the same manner as pancakes. Serve topped, or place small bowls of all toppings on a large platter and let everyone make their own. Excellent...the holiday season is upon us. I LOVE my new Joy of Cooking! I think I may have to make these for the holidays. I love these! They look so cute, but also pretty healthy!